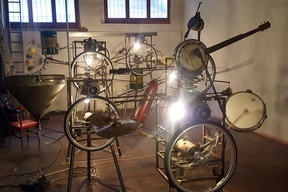 The Automàtics are an installation of 6 sound automation that were built for Suz/o/Suz of the Fura dels Baus performance in 1985 and remodeled several times the last in 1988 for exhibition Automàtics in the marquee from Teatro Español, Plaza Santa Ana from Madrid, Spain. 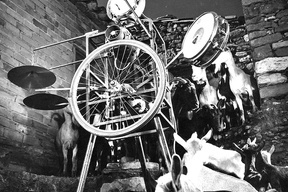 The main function of these instruments during the twelve year long tour Suz/o/Suz, was to be to produce a percussive sequence at the beginning and the end of each performance. After over eighteen years of being unused, Marcel·lí Antúnez Roca recovered them for their restoration. This reatoration was show at MACBA, Barcelona in 2016 within the exhibition "Rastres del Punk". The Automàtics are 6 moving and sound pieces named JAZZ, BOMBERO, MAREA, FOLKORICA, JEVI and PROCESIONARIA. The machines are built under a unique pattern, a washing machine engine that activates a bicycle's weel that reducts and sometimes works as a clutch. It moves a toothed wheel cylinder that propels several arms that play different objects characteristic of each machine. By Marcel·lí Antunez and Jordi Arus. Design and construction of engine modules in 1985: Joan Solà and Albert Forcada from Prat Petit, Moià. Restoration 2016: Yansy Soler and Prat Petit, Moià.